When two families want to adopt the same rescue dog, single mom Kate faces her fear of falling in love again after agreeing to shared custody of the pup with single dad Eric and his son. Jamie Spellman struggles to balance her dream of painting with the reality of such a difficult career choice, while having to choose between two men who seem perfect, but for very different reasons. Cassie has just published her first book, a romcom on her divorce experience. To help a new writer along, the publisher pairs her with the established "dragon writer" Elliot on a week long book tour. Will they remain singles? Samantha returns home for her town's winter festival to celebrate her father's retirement from coaching. Her hopes for a quiet visit are dashed when she discovers NFL quarterback and high school sweetheart Jake is also there. 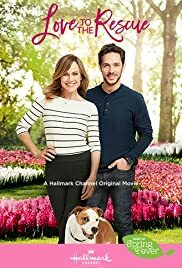 Nikki Deloach (Nikki) delivers once again in this "barktastic" love story. The on screen chemistry between her and Michael Rady was reminiscent of Tolstoy's Anna Karenina and Count Vronsky. You couldn't help but root for Nikki, the supremely talented cartoonist and erstwhile scorned lover, to find the true love she so deserves. Michaela Russell and Max Ivutin play the adorable children Sophia and Owen, whose love for the same dog is the catalyst for their parents to find love in each other. Set against the stunning backdrop of Savannah, "Love to the Rescue" will melt the heart of even the most steely Hallmark connoisseur. On top of the impeccable script, the casting and direction of the extras was spot on, with the performances in the café, office, and theater scenes being exceptional. Director Steven Monroe elevated his game to the level of Mervyn LeRoy's "Quo Vadis" or DeMille's "The Ten Commandments" with a stunning aesthetic that is sure to remain a benchmark for decades to come. Bravo, Hallmark!